In the winter you need a winter jacket - average temperature is 0. In the summer you need shorts - average temperature is 20. For the last couple of years it has snowed for only a couple days - the snow does not survive long on the ground. Between November and March it is mostly cloudy. Spring time is flood time. In 2002 the area around the river Vltava was underwater. Animals from the zoo were swept away, the metro flooded, sub ground and first floor restaurants in hundred year old buildings were completely submerged. Lessons were learned and protections are now in place but you never know - it will happen again. The flood of 1872 washed a chunk of Charles Bridge away. Czech is a valley surrounded by hills and mountains. Looking at an elevation map you clearly see the outline of the country. This natural border probably explains how this little country has been able to maintain its unique culture in the middle of Europe. If you want to go skiing the mountains in the north are the highest. If you want to go boating the lakes in the south are the largest. You can get on your bicycle in Prague and start following the river downstream. If you keep going long enough you will end up at the North Sea. Czech Republic truly in the heart of Europe - not in the middle but a little to the right. In 1918, after the breakup of Austro-Hungarian Empire, the modern day Czech Republic was combined with modern day Slovakia and Czechoslovakia was born and wed. Like a married couple they stayed together through the rough times, and also like a couple they bickered and nagged the whole time. They finally broke up in 1992 - because no tears where shed or blood spilt it is referred to as the Velvet Divorce. There are around 10 million people in Czech. 2 million of them live in the biggest and Capital city Prague. The second biggest city is Brno with almost 1 million people. There are a couple smaller cities - Plzeň and Ostrava. The remaining 6 million are scattered throughout in little villages. Czech uses the Metric system. Electricity coming out of the wall sockets is 220V and AC 50Hz. The sockets are the same as in the rest of EU. Use your thumb for counting. 1=thumb. 2=thumb and index finger. You will be offered slippers when you visit someone’s home. Wear jeans to the Opera at your own risk of being frowned upon. There were 62 people murdered last year out of a million that weren't. Prague is safe. Czechs are natural born mushroom pickers, gathering up to twenty thousand tonnes of mushrooms annually. Early mornings they head to the forest with a basket under their arm and a small knife. They know where to look, when to look, and what to look for. Mushroom’s can be deep fried, put in soup or simply mushed together in a kind of goulash. The official language is Czech and is spoken by almost all. The younger generation is eager to learn English and most of them can understand enough to communicate and understand popular songs. The older generation rarely speak English because they spent their school years learning Russian. Politically Czechs living in Prague are different then those in the ‘country’. In the last election a majority of communist party supporters did not live in Prague. Czechs are said to have golden hands. This is not a reflection of their colour, but of their ability to bring back to life an abandoned 75 year old tractor with nothing more than a bent led pipe and twine. For most of the twentieth century the Czech people have been ruled by foreign occupiers. Austria-Hungary till 1918, then the Nazi’s for a couple years starting in 1939 and finally U.S.S.R. till 1989. Since 1989 Czech have ruled themselves. Since then the most repeated complaint about the current government is the high level of corruption. Although a member of the EU, Czech has its own currency called the Koruna. The abbreviation is Kč or CZK. It does not have its own special symbol like the dollar $ does. 1 USD is around 25 CZK. 1 EUR ~ 25 CZK. 1 GBP ~ 40 CZK. For the Dollar and Euro there is a quick way to calculate the conversion: remove the last digit and divide by 2. For example if the price is 1000 CZK, convert to dollars by removing the last digit: 100 and dividing by 2: $50. It is not exact but it will prevent you paying $30 for a quarter pound of ham from the tourist preying street vendor (don’t worry, there aren’t that many). Plenty of bank machines. If your bank card works in New York, Tokyo, London, it will work in Prague. Currency exchanges are everywhere. Avoid exchanging at the Airport because it is unnecessarily expensive. Also avoid exchanging from the messy haired stranger in a trench coat that approach you - he saw you coming from a mile away. Pick pocketing is a problem, but no more than in any tourist hub. As long as you don’t wear your big bright red fanny belt open and you are constantly pulling money out of it like Santa Claus then you should be fine. Pick pocketers look for targets, don’t be one. The most popular car is the domestic brand Škoda. You have probably never heard of it because the cars are built and sold mainly in Czech. The Škoda brand is a national treasure famous for building airplane, tank and other heavy machinery engines since WWI. Even though the german Volkswagen company bought a majority share of Škoda in 1994, Czechs are proud to own and want to drive a car with the Škoda label on the grill. The national yearly wage is around $1500 per month. Consider that when you notice how well dressed the people are. Charles Bridge was first built in 1360. Legend has it that egg yolks were used to hold the stones together. The statue at the centre of Old Town square is of Jon Hus. He held exactly the same views about the injustices of the church as Martin Luther, except that he had them 100 years earlier. Luther became famous and is remembered by history, Hus was burned at the stake and mostly forgotten. Before there was Prague buffaloes roamed the land. In 1355 Prague was the seat city of the Holy Roman Empire and Charles IV was the emperor (yes he is the one who got the bridge built). Till the end of WWII the area around the northern and southern border was populated by german families that have lived there for many generations. At the end of the war the german families were forcefully evacuated and their family homes became Czech property. It is a hot button issue to this very day. Tip at a restaurant between ten and fifteen percent. You do not need to learn the Czech language to order a ‘svickova na smetane’. Most places in Prague have an English menu which will state ‘slices of pork with sliced bread dumplings’. Beer in tourist spots costs 50 CZK ($2.78 us). In non-tourist spots the same beer costs 23 CZK ($1.27 us). Smoking is allowed in restaurants by default. Only a few restaurants have chosen to become smoke free. Most pubs are a fog of smoke, especially in local establishments. A popular alcohol shot among the younger crowd is called zelena (green) - it tastes like mouth wash. The older prefer Fernet - it is brown and bitter. A waiter will not take your plate unless your fork and knife are together - it means you are done. Beer is classified differently then in the rest of EU. 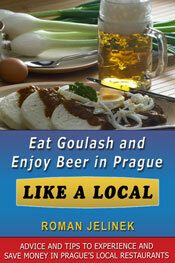 In Czech beer belongs to the food category because it is considered a mandatory compliment to the meal. Because it is categorized as a food many alcohol taxes do not apply, that is why Czech beer is $1.50 per pint instead of the EU average of $5 per pint. The default coffee size is expresso served in a tiny cup that you hold with the thumb and pointer finger - a sipping coffee. If you want the larger coffee it is called an Americano. Ketchup is not free and is provided only if requested - even with fries. And yes, you can order mayonnaise with your fries but it is called tartar sauce. Almost every metro station has a bathroom. So whenever you are on the streets and need to go - find the nearest metro.